1 more week for Hair Fair 2009! This year NDN is participating on this most coolest Annual Hair Event, and our mission is to help with the result of the sales donate for the Locks of Love (Chosen Charity Institution). Be prepared to see 4 sims of pure Candy, you will be on desire to never leave up there! Events to come, even a Flickr Contest running for the best looking hair picture hair fair team is looking! NebuchadNezzar will be doing 2 years of existance, and we brings you the most differencial styles from RL to SL. Cyberlox, Dreadfalls, Hairfalls, we specialize in Cyber Raving gear (Cybergoth), with outfits, hairs, accessories for clubbing. We will blog soon more about our presenting hairs for this event, so stay up on touch! Today i want to help with a friendly post with the most basic needs for starters. When you born in-world, the first thing that you might worry is how to use Second Life. There are bits of Help Islands that are formed by groups of SL Mentors and they are always there to help you in any tips. Don’t start your second life worrying about how to earn money. You need to understand how does it works, what are the basic deeds and knowledges that you must have to start having a job or own business. You can be everything you ever dreamed. From Human to furries or robots, you can roleplay and meet lots of people with same interest as you. Another basic thing for starters to get a second life beautifully are the freebies. Freebies are free items collected from all over the SL world (clothes, shoes, hair, acessories, jewelery, Ao (animation override)) made from the most SL experts. You can buy it for free (0 L ) and make your avatar looks more interesting. There are tons of freebie lands wich gives you opportunity to start your life with something in hands, and i will put down few links to teleport you to those most interesting places. These are only few ones from the huge list of freebie lands. You may find freebies at some pro stores, they usually gives you this gift of courtesy by visiting them. http://slurl.com/secondlife/Brampton/160/188/0/ – Orientation Stations – Need Help? The new awaited episode from CSI – NY, wich does Second Life to be shown to whole world, see Mac Taylor (Gary Sinise) entering Second Life to pursue a killer who has killed a Second Life user in a case of virtual stalking gone too far. 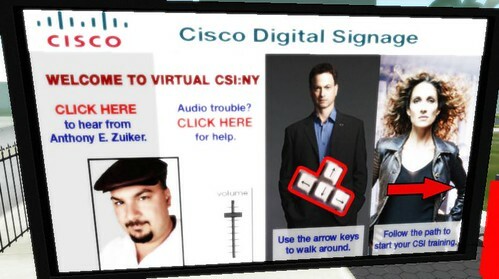 CSI -NY fans will be encouraged to join Second Life and investigate the case by following a link on the CBS website. CSI-NY will have three options for CSI-related inworld activities. The first option will allow viewers to walk around virtual New York buildings and visit a CSI lab and play forensic games. There is already an Orientation Island wich you can visit to see more information about CSI-NY in Second life.